Like so many hot sauces, the original purpose was to disguise the taste of shipboard rations and ripe meats. A taste for the incendiary additive was passed on to land-bound and sea-faring Bermudians. synonymous with Sherry peppers, and a whole line of zesty gourmet condiments. The humble beginnings of this “cottage” industry, operated by Yeaton, his wife Betsey and their daughter Louisa, was originally located in the cellar of the old slave quarters at “Villa Monticello”. Yeaton would stir up the original secret brew that gives all the Outerbridge’s products their particular kick. Most of the spicy sauces bear reference, in one way or another, to the term “hot”. In Bermuda, for the uninformed, if you have been out on a bit of a toot and imbibed a little too much, you are known as hot. On the other hand, if you were out most of the night and legless’, some might just call you full hot. If two or three days have gone by and people were about to report you officially missing, you are Royal Full Hot. famous Bermuda Rum Swizzle. Bermudian cuisine is an amalgam of the many tastes, foods and culinary traditions imported by those who have come to live on these Islands. The earliest settlers from England brought with them a fondness for certain foods. The Portuguese, Africans, West Indians and North Americans have all, over four centuries, added their own particular pleasures to the pot. From roast beef and Yorkshire pudding to shark hash, from a tipsy trifle to a savoury cassava pie, afternoon tea to a Rum Swizzle, Sunday codfish breakfast, paw-paw casserole, hoppin’ john’s, loquat liqueur, to our national soup – Bermuda Fish Chowder, an island cuisine has emerged and Outerbridge’s Peppers has long been a companionable component. 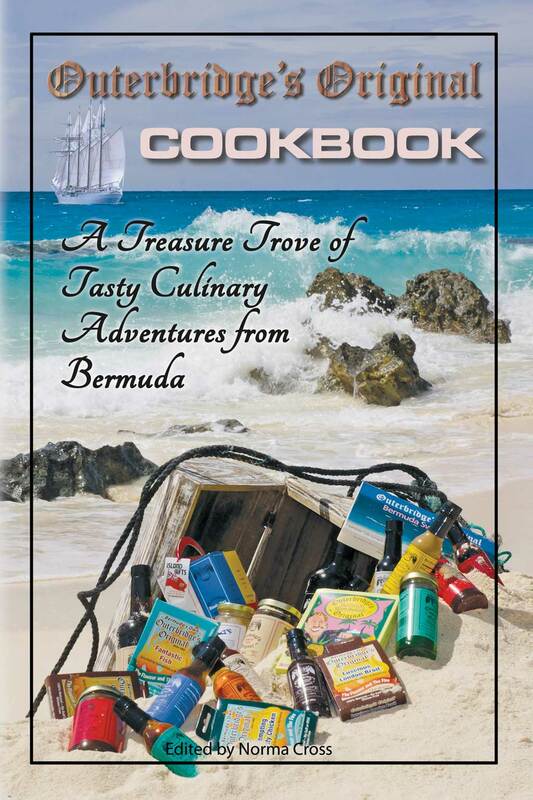 This book is a collection of “Bermuda Family” recipes all enhanced, enlivened or just “kicked-up” with a variety of Outerbridge’s Original Products. Use them in everyday cooking to make the occasion special, and especially for family and friends who like “The Flavour and the Fire”. Keep the Shaker Bottle on your table as you would salt & pepper!